The installation of the fire-alarm device for the house was made an obligation. The reason to make the installation of the fire-alarm device for the house an obligation is that the death toll of a fire decreases sharply when the fire-alarm device is set up. What is the fire-alarm device for the house? It is a device that informs them of a fire reacting to heat and the smoke etc. of a fire when a fire breaks out because of the sound and light, etc. This photograph is an example of the fire-alarm device for the house of the smoke perception type of the battery operation type and the wireless synchronization type. It operates surely at the emergency and safety is secured convenience though the price is a little high. It might be not only ineffectual when it makes a mistake in the selection but also there is various kinds of fire-alarm devices for the house, and doesn't obtain a necessary warning. You may set it up even in building though it turns to the existing housing because it is not necessary to wire for the dry battery type. There is something that operates for five-as many as ten years with a lithium battery. It is necessary to wire 100V type and the synchronization wiring type for the power supply and synchronization. It is suitable for the newly built residential building because it newly wires for this. Smoke detection type and heat detection type, etc. Please set up the smoke detection type in the bedroom, the stairs, the passage, and the room. 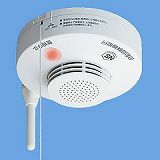 The smoke detection type can find a fire even a little early because it reacts only with smoke. It is usual in the kitchen to set up the heat detection type. The kitchen because there is a possibility of the false report when it is a smoke detection type there are a lot of smokes and steams. The heat detection type doesn't react if the fire becomes some size, and the ambient temperature of the detector doesn't go up. Therefore, you may set up the fire-alarm device of the smoke detection type at a position left a little from the place in which it cooks in LDK etc. Besides this, it might be not general though there is a fire-alarm device for the house where the ultraviolet rays detection type, the carbon monoxide detection type, and the infrared rays detection type were used. The voice warning type is a type. as inform them by "It is a fire" etc. and the voiceIn general, there seem to be a lot of using with the buzzer together. Please set up a more visually handicapped ear with the supplementary warning device of which it informs them by both the sound and light. If any raises an alarm, all give warning in the synchronization type though only the alarm unit gives warning in a single type. When it wires for two or more alarm units mutually, and either of alarm unit perceives it, the type that all the alarm units rumble is called the synchronization type of the cable type. Because it informs each room where the alarm unit was set up of it all together, a fire of a room away can be found earlier though the wiring between the alarm units is necessary. Wireless expression synchronization type synchronizes mutual wireless by using the electric wave etc.If it is a battery type, wiring is also unnecessary. The effect of warning is a large, recommended type though is necessary the registration of the battery exchange and the equipment. It installs it on the passage in the floor when there are five rooms or more of seven square meters or more per floor. It sets it up in a place left from the wall by 60cm or more when setting it up in the ceiling part. In a word, it doesn't set it up on the corner of the ceiling. It sets it up 1.5m or more apart from the air conditioner when there is an air conditioner. It is because the influence of the wind from the air conditioner is lost. The distance from the ceiling sets it up within the range of 15cm-50cm when setting it up on the wall. It doesn't set it up on the corner of the wall and the ceiling. Take care about a malignant door-to-door selling. The fire-alarm device for the house of a high price might be sold by the door-to-door selling, it apply, and take care about the door-to-door selling, please. The fire station member introduces himself, and moreover, say, "Came from the fire station", and take care because purchase might be compelled.